This cute summer sundress has a longer midi length A-line cut and delicate details we love. The Blink Of An Eyelet A-Line Midi Dress is fully lined. It has a V neckline, adjustable spaghetti straps, an empire waist, and a flowy A-line midi skirt. Embroidery and eyelet cutouts decorate the bust as well as the bottom hem of the skirt. A hidden side zipper completes this dress. The Blink Of An Eyelet A-Line Midi Dress is perfect for your next summer gathering or party. Pair it with beige pumps or wedges for a lovely look. Details: Fully lined with mesh underneath skirt at hemline. Hidden side zipper. Adjustable spaghetti straps. 100% rayon. Lining: 100% polyester. Dry clean only. Small measurements: Length from top of bust to hemline: 34". Bust: 32". You have added Blink Of An Eyelet A-Line Midi Dress in Apricot into Wishlist. You have added Blink Of An Eyelet A-Line Midi Dress in Apricot for Stock Notification. 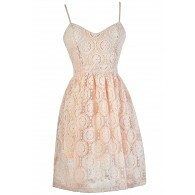 You have set Blink Of An Eyelet A-Line Midi Dress in Apricot as a loved product. 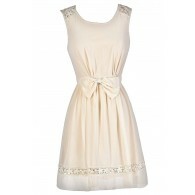 You have removed Blink Of An Eyelet A-Line Midi Dress in Apricot as a loved product.